Great post. It's incredible how much you can do with reporting services out of the box, if you just have the right ideas. The first picture is great and your example how to do it is also great. It will definetely solve certain graphs that I had in mind but I couldn't find a proper way to visualize it. I think having too many colours is very distracting and makes "data reading" much harder. Hilmar examples require much less effort from me to see data. What do you think? it's a Great post Jason, I hope that you post more about SSRS. Because, i had red some books of SSRS but these are basic. You are the great, i have been following your posts and blog since almost 3 years.I am maintaining one specific folder your posts, you are the star. Jason bhai,please please help me by providing the solution for zoom on charts, select a piece of area on the chart and zoom that particular spot,it's like Bing maps/Google maps.I hope i will read that solution on our blog very soon. A very nice post on charts Jason. Slowly i am becoming a fan of your blog. Great post. In the last image with the stacked bars, how did you managed to get the blue bars in the background to be wider? can't seem to find the setting to adjust. It's actually a range column chart with same values and same color but 2 columns. So it looks like one wider column. Many thanks for sharing your idea. I've been trying to implement the last image in 2012, but I can't seem to get the inner bar to centralise – it's rendering left or right justified, any thoughts why this is happening? 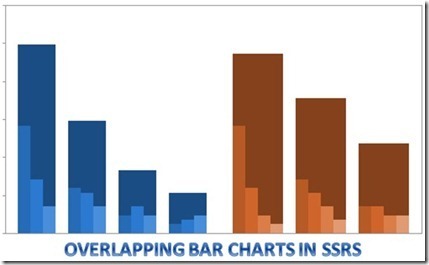 Ola, ensure that the inner bar is a stacked column chart (so you have series as well as category) and the outer bar is range column chart (and since there are 2 values in series, you will get 2 range charts, one each on the left and right of the stacked column chart). From your description, it looks like there is only one value in the series, in which case it may appear left or right. For just one value, you can just convert the chart to 3 D and reduce the pixel width of the inner bar. If this doesn't answer your question, could you detail out more like what is on your category and series? Hi can you suggest me if we can create a chart as shown or not using SSRS. Awesome Post. Works like a charm. Thanks !! Excellent post, this is exactly what I needed, thanks! However, do you know if it's possible to add a single Data Label atop the calculated measure. If you enable Data Labels for that series then you get multiples overlapping due to the component parts making up the larger cyan bar. For now I have added an expression with SUM() to the Year group, but would prefer it to have the total displayed within the chart. Hope that makes sense. Thanks! Thank you for the Sum expression by Category. While this is far far from what I needed, it took me towards the solution! Could you please solve the problem of “series label moves out of the bar in horizontal range graph”. The problem is occur only when the amount of data is high. We already check all the series label properties. But, we could not found any solution. Please provide a suitable suggestion as soon as possible. Waiting for your reply.